If you’re struggling to open your old garage door, electric operation can be an extremely appealing proposition. There would be no more heavy lifting required, and with just the push of a button you could be inside your garage with the greatest of ease. If you’ve got a large garage door or an old wooden garage door, then electric operation might be the best option for you. Many older garage doors require great strength to open and can often be dangerous when closing due to their weight and lack of control when closing. Like any mechanism, garage doors often experience wear and tear as they get older and sometimes electric operation is not an option, and a full refit may be necessary. The Garage Door Team has experienced garage door engineers who can advise you on the best course of action, free of charge. As years have gone by technology has developed, and nowadays it is often possible to retrofit a garage door with electric operation. There are a few exceptions, for example on older garage door models with very odd springs and gearing. The most important thing to be aware of is that an electric operator will not help on a damaged or badly fitted garage doors, which can be heavy due to being unbalanced. All electric garage door operators from The Garage Door Team feature the latest safety features which ensure the garage door will stop if there is an obstruction, which is ideal for families with young children or pets. This safety feature is built into all CE compliant modern electric operators. We offer a wide variety of doors including Hormann garage doors and Garador garage doors which all incorporate these safety features. 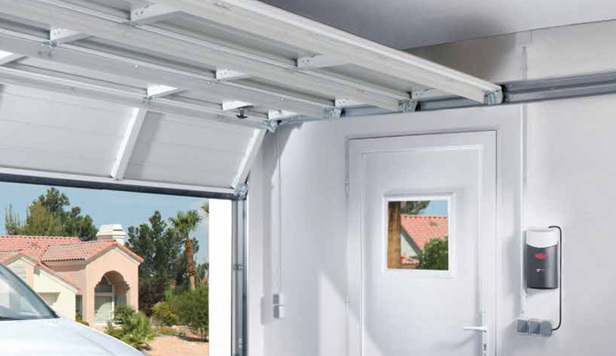 Retractable Up & Over garage doors are the easiest type of garage door to add electric operation to. It consists of the installation of a boom above the structural opening with an electric operator motor installed at the other end. This is simple, easy and straightforward and one of the most cost effective options available. It provides a smooth and quiet action and will be perfect for most households. Canopy Up & Over garage doors require a bow arm conversion kit. A bow arm conversion kit allows for the simple and easy operation of a canopy garage door. Due to their difference in opening with a retractable garage doors, canopy garage doors would struggle to give the same results with a retractable garage door electric set up. For more information on adding electric operation to up & over garage doors, your can talk to your local Garage Door Team fitter. Your local Garage Door Team fitter will be able to provide you with information on how electric operation is installed on these types of garage doors. Sectional garage doors are extremely easy to make automated thanks to their already smooth operation. All they require is a boom and operator and they are ready! The use of a good quality motor is essential and they will give you a high level of security. Generally sectional garage doors will need longer booms as they come into the garage a lot further than normal garage doors, however your local Garage Door Team fitter will be able to provide you with all the information you need. Roller garage doors often require a lot of work to fit electric operators due to the nature of their construction. Most roller garage door electric motors are fitted inside the curtain roll, and therefore they need to be taken apart to be fitted. It is possible however, and your local Garage Door Team fitter will be able to advise you on the best course of action.